They didn't contact us about the package even once. The address on the package is very detailed. There's a reception desk in our building that's staffed 24/7. The UPS contractor could bring the package over any time. They didn't even try to. 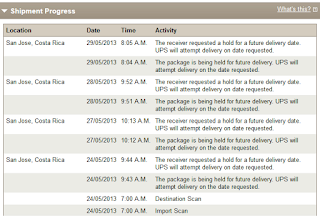 Instead, they're recording these fake notices about how we "requested delivery at a future date". UPS. Unabashedly Pathetic Service. They should wear that on their uniforms, proudly. Insulin: 150.5 uUI/mL (reference range: 2.0 - 27.0) Glycemia: 155 mg/dL (reference range: 60 - 100) Glucose: 8.61 mmol/L (reference range: 3.3 - 5.5) HOMA-IR: 57.59I hadn't been fasting when this blood sample was taken; an hour before the sample, I had eaten a breakfast of 410 kCal and 36 g of protein, the rest mostly carbs.